Defining Discipleship (Luke 14:25-35) | Joe Quatrone, Jr.
Posted on August 12, 2013	by Pastor Joe Quatrone, Jr. Many people today do not understand what it means to be a genuine Christian. There are multitudes who claim to be Christians, but they do so on their terms and not God’s. They do not truly comprehend what it means to be a disciple of Jesus. Because of this ignorance, there are many who consider themselves to be Christians who are really not, even though in many ways they do look like Christians – they go to church, have a profession of faith, read their Bibles, pray, give in the offering, but they are not the real deal or at least they are not living and thinking like the real deal. Jesus confronts this problem of true discipleship in our text today. He makes it very clear what it means to be a genuine Christian. Therefore there is no reason for anybody to be ignorant or self deceived. In a few moments, we will look at how Jesus defined discipleship in Luke 14:25-35 and I will go over the text verse by verse, but before I do I want to explain the word “disciple” which is repeated several times in these verses. A disciple is a true follower of Jesus Christ. In other words, what we would call a “Christian.” If you are a Christian, then you are a disciple; if you are not a disciple, as Jesus defines it, then you are not a Christian. These two terms (disciple and Christian) mean the same thing, just like I mean the same thing when I speak of my “spouse” or my “wife.” The two words are interchangeable. With that brief explanation, let’s now take a look at this passage, verse by verse, beginning with verses 25-27. The first thing I want you to notice is to whom Jesus was speaking these words about being His disciple. Luke notes that “large crowds” were following Him and that Jesus specifically “turned to them” and elaborated on being a disciple. Jesus was not talking to those who were antagonistic towards Him or to those who were uninterested in His life and message. He was speaking to people who were “traveling with Jesus.” They were positive in their attitude toward Jesus. They were interested in what He had to say. But apparently, they mistook their positive attitude and interest in Jesus for true discipleship, as many people do today. The large crowd considered themselves to be followers of Jesus, but in reality they were only casual followers and not committed disciples. They were willing and even anxious to follow Jesus, provided the cost was not too high or the demands too great. They were like many people today who do “Christian things” like go to church, pray, and sing Christian songs, but who are not really committed to Jesus. In a sense, they were “along for the ride,” but were unwilling to give up everything in their lives that conflicted with following Jesus wholeheartedly. They were like many today who look to Jesus to solve their money problems, relationship problems, health problems, and other problems, but who quickly grow disillusioned and unwilling to obey Jesus completely when following Him doesn’t solve all their problems or following Him requires real sacrifice in their lives. These “large crowds” were casual followers and not committed disciples. Which are you? In our hearts, Jesus must come before our loved ones, self-interest, possessions, careers, hobbies, goals, and even our very lives. Now, in practice, our commitment to Jesus will be tested and sometimes, in a moment of weakness, Jesus will not come first in our lives, but genuine disciples have made a sincere commitment in their hearts and will not continue to put other things before Jesus. Eventually, Jesus will come first. In verse 26, Jesus says this commitment applies to “anyone who comes to Me . . .” In other words, Jesus is not speaking exclusively to a special group of Christians such as apostles, evangelists, missionaries, pastors, or even mature believers. He is saying this principle of putting Him first applies to everyone who would be one of His disciples. He goes on to say in verse 26, “Anyone who comes to Me and does not hate his father, mother, his wife and children, his brothers and sisters—yes, even his own life cannot be My disciple.” The word “hate” here is not meant to be taken literally, but is rather used figuratively to express a point. It is a hyperbole or exaggeration. In Jewish culture the word “hate” was used to express lesser love, so Jesus was saying that we must love Him more than we love our closest family relationships or even our very lives. We must love Him more than our hobbies, more than our goals in life, more than our careers, more than our self interests, and more than anything else. Jesus was not speaking of our emotional feelings toward Him or our families, but rather He was speaking of our level of commitment. He was saying our commitment to obey and following Him must be greater than any other commitment in our lives. In other words, Jesus must be first in our priorities and loyalties. Is this true in your life? If following Jesus obediently results in problems or interferes with your closest relationships, will you still follow Him? In other countries following Jesus can sometimes mean being kicked out of your family or losing your children. In our own country, many relationships have encountered problems because one spouse is a committed Christian and the other is not. In such cases, Jesus wants us to know up front what it means to be a disciple. He must come before even our closest relationships. To be a disciple of Jesus means to be committed to Him above everything else. We must not only love or be committed to Jesus more than to our loved ones, but we must also be committed to Him above “even our own lives.” This refers to our physical bodies which we must be willing to surrender for Jesus’ sake. It also refers to our personal lives, which means our personal desires, goals, interests, wants, and even needs. We must be committed to Jesus above our bank accounts, our public image, our jobs, and every other personal desire. If following Jesus means forfeiting these things, then we must be willing to do that. These are not hypothetical situations. Following Jesus will many times mean making such sacrifices. 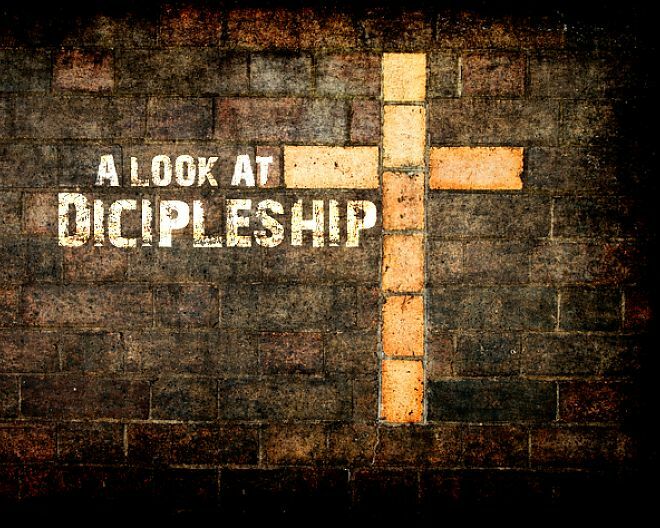 To be a disciple of Jesus means to be committed to Him above everything else. Jesus used a metaphor in verse 27 to re-emphasize this point. Everyone listening in the large crowd was familiar with what Jesus was referring to when he talked about “carrying his cross.” The cross was a cruel form of punishment used by the Romans. A criminal was forced to “carry his cross” to the place of execution. Everyone knew the man carrying his cross was saying “goodbye” to everything. There would be no turning or coming back. Jesus used this vivid illustration with the intent of showing us that following Him requires the same kind of absolute commitment and saying “goodbye” to our own will. Now, some people may think this requirement of total commitment to Jesus is contradictory to the truth that salvation is a free gift of God. It is not. An illustration may help to clarify the issue: Suppose I had a desire to climb Mount Everest, but it costs about $80,000 to do it and I don’t have that kind of money. Suppose a wealthy businessman heard of my desire and offered to pay for the entire expedition. He would buy all the expensive clothing and gear; he would pay for my transportation, the guides, and the training. It’s totally free for me. But if I accept his free offer, I have just committed myself to months of difficult training and exhausting effort. It could even cost me my life, since many good climbers die trying to climb Mount Everest. It is free, yet very costly. 28 “Suppose one of you wants to build a tower. Will he not first sit down and estimate the cost to see if he has enough money to complete it? 29 For if he lays the foundation and is not able to finish it, everyone who sees it will ridicule him, 30 saying, ‘This fellow began to build and was not able to finish.’ 31 “Or suppose a king is about to go to war against another king. Will he not first sit down and consider whether he is able with ten thousand men to oppose the one coming against him with twenty thousand? 32 If he is not able, he will send a delegation while the other is still a long way off and will ask for terms of peace. 33 In the same way, any of you who does not give up everything He has cannot be My disciple. In these two illustrations, Jesus is expressing one simple, but pertinent point. His point is just like it is prudent to consider the cost involved in building a tower or going to war, so too it is prudent to take in to account the cost and commitment necessary to follow Him. Jesus doesn’t want people to make a commitment to Him without understanding and seriously thinking about what is involved in the decision. Jesus does not want a half-hearted, blind commitment that expects no hardship and only blessings. Unlike many people today, including many preachers who are only interested in large crowds, Jesus always favored a small group of committed disciples over a large group of non-committed, casual followers. That is not to say Jesus is not concerned with large groups, but He is more concerned with committed disciples. Jesus wants commitment! However, the condition of much of the church today indicates there are many people who are just part of the crowd and not true disciples. There are many who have not listened to Jesus and considered the cost of following Him. Total commitment is lacking in these people, even though a profession of faith is present. This is why recent surveys indicate there is little difference between the way the world lives and professed Christians live. Moral compromise and half-hearted commitment would not be happening as often as it does if people really understood what was required of disciples and they had considered the cost as Jesus instructed. In verse 33, Jesus once again makes clear the cost of following Him. He says the disciple must be willing “to give up everything.” Everything is a fairly inclusive word, wouldn’t you agree? Everything means everything! Everything means my cushy job, favorite hobby, most prized possessions, free time, money, goals, and dreams. Now, we may not literally “give up everything” at all times, but Jesus is referring to an attitude of the heart in which other things do not have ultimate priority over obeying Jesus in our lives. The Greek word translated as give up means “to say goodbye or renounce.” In other words, Jesus is saying we must be willing to renounce or forsake anything when it interferes with following Him faithfully and completely. Salt was routinely used by Jesus in figurative ways because of the high value people placed on salt in ancient times. Salt was used as a preservative, as a flavoring, and as a fertilizer. Salt, in this case, represents a person’s commitment to Jesus. When that commitment is complete, then the “salt is good.” This means the Christian’s life will have a positive, useful purpose in the same way salt did. But salt, in Jesus day, wasn’t pure like it is today, so it could by various means “lose its saltiness.” If this happened the remaining product had the appearance of salt, but with none of the benefits. It could not even be used for fertilizer or as Jesus says, “It is fit neither for the soil or the manure pile.” It was useless in every respect. Jesus was saying people who follow him without total commitment are like salt that has lost its saltiness. They have the appearance of being His disciples, but they cannot really be used in the kingdom as a Christian should. Jesus was referring to those who only give a part of their lives to Him. They commit to following Jesus one day a week, but not seven. They commit to obeying Him in their marriage, but not in their finances. They give up one thing, but not ten things to follow Jesus. Jesus was saying this half-hearted commitment does not work, just like salt that has lost saltiness is of no use. Jesus concludes this section by saying, “He who has ears to hear, let him hear.” He said this to remind us of our responsibility to not only listen, but to respond, to His words. Jesus’ teaching is not difficult to understand, but it is difficult to accept. To follow Jesus, a person must be totally committed. This is what a Christian is as Jesus defines it. The question we need ask ourselves is not, “Am I able to follow Jesus completely?” But rather, “Am I willing to follow Jesus completely?” I realize we are all human and sometimes we will fail in our commitment, but the thing Jesus is confronting here is not our ability, but our willingness to follow Him with our whole hearts. For those of you who are not Christians, you need to understand what following Jesus really means before you make that commitment. For the majority of us here who are already Christians, let this lesson be a reminder of what being a disciple truly entails. What would change about your life if you were to focus all your energies on becoming like Christ? “It is a shameful thing for a man to profess discipleship and yet refuse to learn his Lord’s will upon certain points, or even dare to decline obedience when that will is known. How can a man be a disciple of Christ when he openly lives in disobedience to Him?” (Charles Spurgeon). This entry was posted in Book of Luke and tagged Bible, Christian, Church, Cross, Disciple, Follow, Jesus, Salt and Light. Bookmark the permalink. Thank you for writing this! Amen! Something every Christians needs to consider. Great article. I reblogged it. I believe the church will still be here during the great tribulation of the Antichrist (but will be removed before the trumpets and bowls of God’s wrath – the church is exempt from God’s wrath). Part of the reason for this is that judgment will begin with the house of God. This time will demonstrate who really put faith in Christ and believe His Word, and who will fall away and disobey the gospel of God. Hi Pastor Joe, just a quick note ( if that’s possible ) before I leave for Sydney in an hour, I’m all packed and ready to go, thank you for your prayers. But you must have not understood my comment in your last Post because once again your message today left many ears still itching , do you really need to be so Truthful, can’t you just water it down a little , like saying…. that is if it’s alright with you, after all don’t we have a say…… Hmmmm we did and messed up big time! 🙄 but yes we do have a say but we will reap what we sow, good and bad and if Jesus does not come first in all things, as you said, it will not be good, He knows what is best for us but in our evil flesh we Don’t and we have no real control, as Satan has a foothold, our flesh must be put to death!……. Now for the good news, Jesus set us free so it could be! Thank you Pastor Joe for not using a feather, if ears itch it will not be by your hand. Thanks Anne. Hope your trip and visit with your mother goes well. Thank you Pastor Joe for your prayers for my Mum and myself, she died when I was in Sydney but as I shared on my Blog your prayers and those of others who cared and prayed were answered in God’s way according to His Loving purposes. He assured me too that Mum would be with Him and then confirmed it. I’m also very thankful her suffering was limited but I do miss her. The last one – the fruit – that is the kicker . . .
8 This is how my Father is glorified — in your bearing much fruit; this is how you will prove to be my talmidim (disciple). it gets ignored – glossed over . . . and yet, what does Yeshua tell us about a tree that does NOT produce fruit? 1 “I am the real vine, and my Father is the gardener. 2 Every branch which is part of me but fails to bear fruit, he cuts off; and every branch that does bear fruit, he prunes, so that it may bear more fruit. 3 Right now, because of the word which I have spoken to you, you are pruned. 4 Stay united with me, as I will with you — for just as the branch can’t put forth fruit by itself apart from the vine, so you can’t bear fruit apart from me. 5 “I am the vine and you are the branches. Those who stay united with me, and I with them, are the ones who bear much fruit; because apart from me you can’t do a thing. 6 Unless a person remains united with me, he is thrown away like a branch and dries up. Such branches are gathered and thrown into the fire, where they are burned up. “However, the condition of much of the church today indicates there are many people who are just part of the crowd and not true disciples.” That is so sad that people will “live” for the look of it rather than the abundance of it. Spurgeon’s quote is also sharp. It’s just me, but I wonder if this is a sermon that should be preached once a month until people really get it? Part of our problem might be in what the church has become. Your are right on the money in your comment, and that is one of the things that frustrates me; have we become the church of Laodicea? It is starting to show now; after several decades of persecution the weak and non-committed are dropping away, even forming new and heresy doctrines. Just to be part of the crowd and still live, is not a committed disciple. Laodicean churches are big in America, but then so are all the other types. These seven churches represent basic church types that will exist in the last days when Jesus is about to return. Laodicia is the prosperity gospel. The churches which commit “sexual immorality” are the other ones that adopt heretical teachings and join with false religious practices. The “dead” church is the liberal church that winks at and approves of sin, such as ordaining and approving of homosexuality. Sadly, in America and Europe, Philadelphia and Smyrna, the only churches to have no negatives Jesus needed to address, seem to be few and far between. This is one of the best (sermons) posts I have read in sometime. I would suggest that if someone is in the fray and finds himself about to become trapped in the political mess that seems endless, one only needs to read this and searchingly consider his commitment to Christ Jesus, and truly being His disciple. It is refreshing and frustration turns to hope. Thank you. good read, very well written, thank you! Thank you Joe! There is definitely a difference between being a “believer” in Jesus and a “follower” of Christ. The Gift and the Prize. Are you a Follower of Christ or just one of the believing crowd? One of your best sermons, Joe. I wish more people would read it and take it to heart. One thing to say, though: when newcomers commit their lives to Jesus, they don’t always think deeply about what they are doing at the moment perhaps because of their excitement in discovering Jesus. (I know. I was 12 when I gave my life to Him, but at 12 years of age, it is not always easy for one to imagine the scope of one’s commitment.) However, the person who sincerely believes will be helped by the Lord to grow into the committed individual He wants him or her to be – that is the power of the Spirit. And He continues to shape and mould us to His will if we allow Him to do so. Your sermon makes it clear that it is an act of our wills as well as the power of the Spirit that will help us to grow more and more committed as Christians. Thank you for sharing. FYI: Have you ever heard of the book entitled “Not a Fan” found in Christian bookstores? There is also a tv series based on the book. Thanks Oscar. I never heard of the book. Why do you ask? Excellent teaching. Very convicting and great reminder of Christ’s call to total commitment. Last Wednesday, when our priest was out of town, I led midweek Evening Prayer Rite II (from The Book of Common Prayer, 1979). I decided to use the assigned readings for the Feast of St. Bartholomew, just a few days away. As I read the assigned Gospel reading, one line stood out in my mind: “The kings of the Gentiles lord it over them; and those in authority over them are called benefactors. But not so with you…..” (Luke 22:25a, NRSV). Then I spoke about the oppressive nature of the Pax Romana, the theme of reversal of fortune in Luke, and of how, in the kingdom of God, the servant is the greatest of all. The kingdom of God in the Gospels is the inverse of the Roman Empire. The kingdom of God, with the first being last, the last being first, the hungry being filled, the naked being clothed, and the grieving being comforted, remains contrary to many dominant social realities. Following that kingdom vision is part and parcel of Christian discipleship. Reblogged this on Love God with all your Heart, Soul and Mind. Sorry I haven’t written. Something happens to my password each time I log in. I just wanted to say, that it is sad and difficult when you see people profess to be Christians, and think they are heaven bound, but are not. They look like Christians, act like Christians, but there is something missing. They are not committed 24/7. I am a teacher and a preacher. When I see a wrong that I can change, I step up and say what Christ would want me to say. I cannot ever not fight, for Jesus Christ and what He stands for and what He has done for us. His grace is sufficient for us. I just hope that others can see what I see, and find the truth before it is too late.